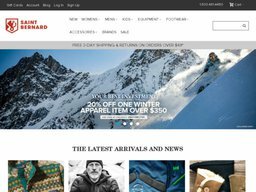 St. Bernard Sports is a retailer of skiing, snowboarding gear, and broader apparel - based in Dallas, Texas, USA. The privately held company has under 100 employees, with Wes Goyer currently serving as president. The company was founded in 1978 by current president Wes Goyer and originally focussed on a few specific surf, snowboard and ski products. By the 90s the range had expanded greatly to include clothing, shoes and accessories. StBernardSports.com is a comprehensive ecommerce site that stocks most of the inventory available at the three retail outlets. StBernardSports.com organizes its products in to the following main categories: What's New (new products), Women's, Men's, Kids, Equipment, Footwear, Accessories, and Sale Items. There are hundreds of different brands to choose from, and you can also use the search bar if you know what you're looking for. As well as its products StBernardSports.com also has a News & Events page and a Blog, keeping people updated about the business and skiing and snowboarding in general. To redeem St. Bernard Sports coupons all you have to do is browse our up to date list here at Coupofy, and when you see one you like, clicking the link will take you directly to the store where you can enter the code in to the promo box, just ahead of the payment step. For payments StBernardSports.com currently accept PayPal, Visa, MasterCard, Discover Card, American Express, and their own gift cards. The site ships products globally, allowing you to select your country during the checkout process to calculate the full costs involved (this is all still displayed in dollars). You do not have to register an account and can checkout as a guest, though registering allows for faster orders in the future and can make the returns process easier. The cost of shipping will vary from region to region, but in the United States all orders over the value of $49 get free 3 business day delivery. Below this threshold it's $20. There are also options for Two Day, Next Day, and Next Day Saturday shipping. From time to time you can also use a free shipping St. Bernard Sports coupon code, to get free shipping regardless of the order value. They operate a 15 day returns policy, meaning returns must be back at their warehouse within 15 days of receipt to qualify for a full refund and free returns shipping. All orders are shipped with an appropriate prepaid label. Miss this date and a $7 shipping will be taken out of your refund. If you miss the 45 day mark you will only be eligible for store credit.